Exposure to biohazard contaminants, including biological and chemical, can pose serious health consequences. Failure to properly remove hazardous substances contributes to unhealthy environments. 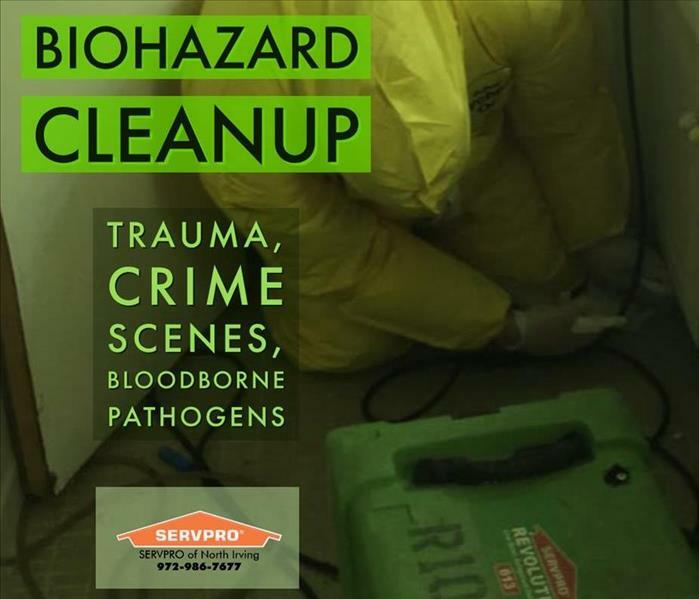 SERVPRO of North Irving is trained to safely remove biohazards and pathogens. We dispose of them properly in accordance with OSHA and other health regulations. Our technicians transform unsafe environments back into clean, safe homes and offices. We have serviced Dallas Fort Worth for over 30 years, and we have seen it all. Our experience includes cleanup situations caused by sewage, trauma, hoarding, unattended end of life deaths, suicide, and crime scenes. We treat all our clients’ property with respect and provide confidentiality. You know SERVPRO of North Irving as a trusted leader in fire and water restoration. We are also an expert cleaning company. We provide biohazard home cleaning services and every commercial property. Our technicians have been dispatched to all of Dallas Fort Worth. We are locally owned and operated, and we’re ready to help. Refer to our Biohazard Emergency Tips and follow our tips to protect yourself until we arrive. We remove and dispose of bodily fluids, tissue and other potentially pathogenic substances resulting from accident, trauma, crime or death. Trained SERVPRO of North Irving Professionals clean, disinfect and deodorize the structure.